Characteristics of Dr. Edward J. Nichols - compassionate, caring, generous, patient, friendly, humorous, loyal, dedicated, knowledgeable on a varity of topics including: history, current events, and engineering, musician (guitar, piano, bass guitar), world traveler, avid photographer. Brought back to health and found homes for hundreds of stray dogs and cats. Brief Bio: Born in Philadelphia, Pennsylvania in 1949 to an active duty military family, married to Irma Saenz Nichols for 39 years. Irma is a retired speech and language pathologist. Dr. Nichols has two children: one son (Padraic) who is currently serving as a pilot in the Navy, and a daughter(Erin) who has just completed a Communication Arts/Broadcast Journalism degree of the University of the Incarnate Word. Erin is currently a television reporter and news anchor. 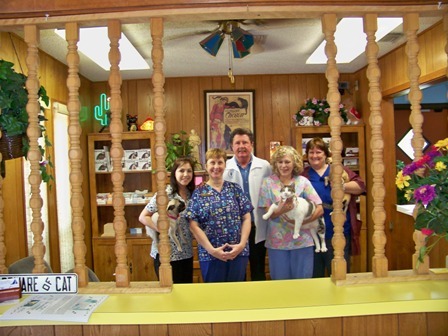 Dr. Edward Nichols has five cats, one dog and one fish of his own, not including the cats and dogs that live in the clinic.